Artwork by Rosemary Woodford Ganf. Bandicoots are harmless, small, nocturnal, omnivorous marsupials that used to be common in Sydney backyards. Size: Fully-grown bandicoots are slightly longer than an average tissue box. They typically range from 31cm to 42cm long, measured from the tip of their tail to the nose on their long, point snout. Weight: At maturity they weigh between 850g and 1.1kg, three times heavier than black rats for which they are sometimes mistaken. Shape: They have long conical snouts, relatively short tails (shorter than their bodies), quite large, pointy ears, and long, pale-coloured paws that are good for digging. Colour: The fur is brown on the back and white on the belly and under the head. The young have pale bars on the rump. They feed on insects, roots, tubers that they dig for in the soil, often leaving distinctive conical holes in lawns. They also eat small lizards and even pet food left out for cats and dogs. When they are frightened they will make a loud sneezed ‘ke’ sound. They usually forage alone at night, digging in topsoil for insects, roots and tubers, often leaving characteristic conical holes in the ground. During the day they retire to nests under bushes and houses where they scrape a small depression and line it with leaf litter. In the north of Australia they reproduce all year round, but in the southern states breeding stops in the winter months. They are highly reproductive. About 85% of the females studied at North Head reproduced every year, but many offspring (75%) die before they reach maturity. Litters range from one to five young, but are usually of two or three. 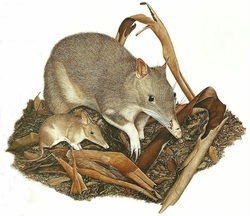 Gestation takes only 12.5 days (they are marsupials so much of the development happens in the bandicoot’s backwards-facing pouch), and females can produce a litter every 70 days. They are common along the east coast of Australia but have become uncommon in large parts of greater Sydney due to loss of habitat and predation by cats, dogs and foxes, and from being hit by cars. The populations closest to the inner west is at Lane Cove National Park (11km away) and North Head (15km). Some studies have shown bandicoots disperse well, in one study up to 4km in just two weeks after being released. Take a photo! If you don’t have a phone or a camera, write down the time and place where you saw the bandicoot and email us at iweg@greenway.org.au.